Here we are at the end of 2009, and the film industry is boasting its most profitable year ever. And while I’m sure we’re all happy that Paul Blart: Mall Cop made nearly $150 million, I’d like to take this chance to look back to ten years ago, when I believe there was a renaissance in film. 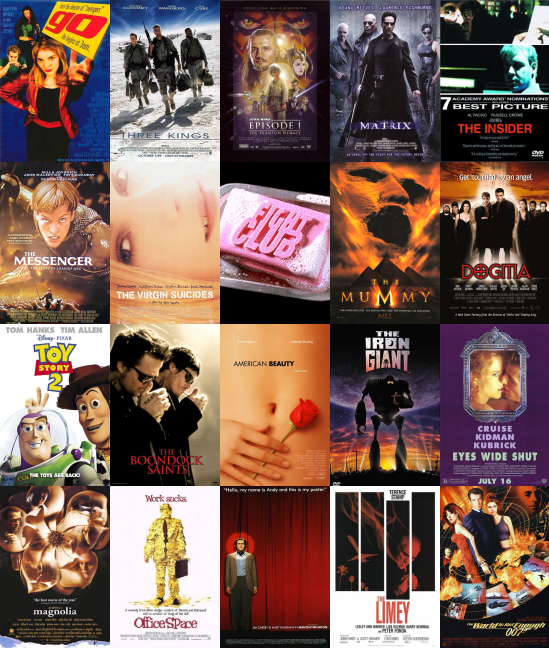 1999 is by far my favorite year in movies, and I’m not the first to point out that it contains an unusually large number of stellar films as well as more than its fair share of masterpieces. What follows is my own personal list of ’99 films that I felt worthy of highlighting. Most of them I own or have seen multiple times, although there are a few I’ve never seen. Some I don’t even like and are included purely for their reputation, good or bad, the point being that yes – amazingly – ALL of these movies came out in the same year. As you peruse the list, make note of the titles you haven’t seen – I urge you seek out all of the lesser-known films. One is left to wonder about what the hell was going on in the few years before 1999, when these films were being written and filmed, that created such a perfect storm of creativity and perfect execution? Logically, you just have to accept that 1999 must have just been one giant coincidence. Well, ’99, I love you anyway, even if you were just a fluke.